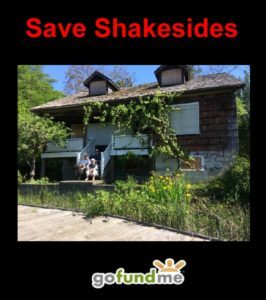 On April 4, 2017, the Town of Comox filed a petition with the BC Supreme Court to overturn the Mack Laing Trust, demolish Shakesides and create a viewing platform, violating the original terms of the Trust, which required the Town to create a “natural history museum” in Shakesides. The Town claims there wasn’t enough money to do this, yet accepted the funds and used them for other purposes. It also rented the trust property from 1982 to 2014. The Town’s Vancouver lawyers, Young Anderson, also claim that neither the Comox Valley Naturalists Society, or the Mack Laing Heritage Society, should be granted intervenor status in the court action, claiming, in effect, that Council is the only entity which can speak to the best interests of the Town – a contention which many citizens disagree with, given the decades of mismanagement of the trust property and the lack of appreciation of the trust fund principal, along with its failure to meet the terms of the trust bequest. The Town has also consistently failed to accept proposals from local environmental umbrella groups for a community-building project and let Shakesides be vandalized. Despite this, the house could be restored for considerably less cost than the court action they are undertaking at taxpayer expense. In 1982, when Mack Laing died, the house, according to eye witnesses, needed virtually no work to convert it into a modest nature museum. The town received $45,000 in the bequest, the cost of an average single family home in Comox at that time.